HWLH News Letter - Issue #008 - Is the Oz effect giving false hope and information? Issue # 008 - Dr Oz Weight Loss products - Is the Oz effect giving false hope and information? Dr Oz weight loss products are said to give the Oz effect. What does this mean? It means that every product that Doctor Oz promotes on his TV show is accepted, with almost no questions asked by his viewers. This can be a dangerous thing as it can raise people’s hopes in some products that may be falsely advertised, not to mention the money people may spend on some of these products that may not work. Seems this is the reason why Senators on Capitol Hill have decided to grill the doctor regarding false advertising on his show. 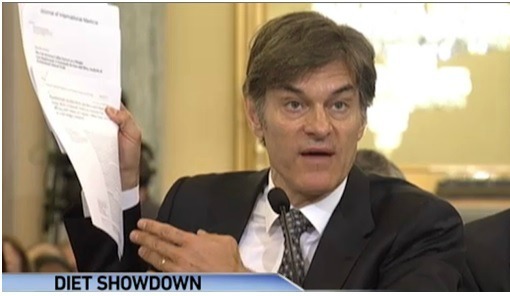 Here is the link that takes you to the CNN video showing the debate between the Senators and Dr Oz. Senator Claire McCaskill, chairwoman of the Subcommittee on Consumer Protection, Product Safety and Insurance, led the discussion by looking at false advertising for weight loss products that don't seem to have much scientific evidence or proof to back these products up. Such Dr Oz weight loss products include green coffee beans and Garcinia Cambogia Extract. McCaskill said that these products that the Doctor has called "miracles when it comes to weight loss" are discouraging because they offer "false hope" to the consumers. She said "I don't get why you need to say this stuff when you know it's not true. When you have this amazing megaphone, why would you cheapen your show? ... With power comes a great deal of responsibility." Why was the Doctor Questioned? Because the Federal Trade Commission is in charge of protecting consumers from false, deceptive or unfair advertising when it comes to products or practices that are bogus and perhaps even raise health issues or safety concerns. In May the Federal Trade Commission sued the sellers of Green Coffee Beans for selling a product to consumers that doesn't do what it says it does as it used fake and invented health claims to sell their product. But let's face it, any product promoted on the Dr Oz show always gets lots of positive recognition, even if there is no real scientific evidence to support it. In fact, just weeks after the Dr Oz show promoted the benefits of these green coffee beans, many companies that sold the product used the video from his show to increase sales. The doctor admitted to using "flowery language" when describing certain products on his show, but he believes in all the products he promotes on his show. In fact he believes in them so much he has even given them to his family members. Oz stated that he cannot be held responsible for what other companies say about these products online. He also said he will use less flowery language and will publish a list of those products which he really believes help people with weight loss. Oz also admitted that many of the claims he makes about weight loss supplements are not based in fact. The internet offers a plethora of information on just about everything, but not everything sold on the internet is a safe or a good product. Product research is the key. Try to gather as much information about a product you're interested in buying and see if they have any real scientific backing if you can, but that is sometimes not always possible. The reason we must take these extra steps is because weight loss supplements, presently, do not need FDA (The Food and Drug Administration) approval before making them available to the consumer and the FDA does not regulate them. But if a product seems unsafe then the FDA will step in and investigate and remove the product from the market if necessary.